I could write about many things that occupy my mind today. About me being away from home, nestled in the cosy comforts of my parents home for a long break, post the baby, about our current short break in Bangalore, about the shifting once I get back to Mumbai or I could simply go on and on about dal. It’s going to be a while before life sets into a routine back home in Mumbai. 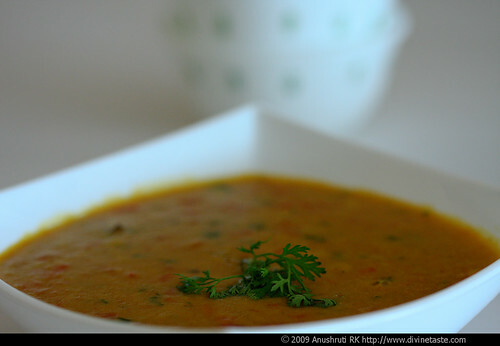 Dal tadka is the topic of today's conversation because it is going to be an important part of that routine. Dal tadka or dal fry with Jeera Pulao is one of my favourite meals. Add a vegetable and a salad and it becomes a compete meal. Simple yet elegant! It is amazing how a meal of dal and rice can bring supreme comfort to one’s soul. Or eat this dal with roti and you have both nutrition and contentment in a plate. Although there is a vast difference between Indian food served in the hotels and food cooked in Indian homes, dal tadka is one food that is probably also one of the most widely enjoyed both at home and in a restaurant. The dal or lentil used can vary and the seasoning can differ but a meal of dal and rice or dal and roti almost always warms an Indian heart. I’m yet to meet one who disagrees. The technique for making dal tadka is almost always the same. Cook the dal of your choice and add a simple tadka, baghar or chaunk (seasoning) with ghee or vegetable oil and some spices. The variety can come in the form of the kind of dal used. It could be red gram dal, green gram dal, Bengal gram dal or black gram dal. I prefer to use red gram dal on a daily basis reserving the other dals in my pantry for occasional use during the week. 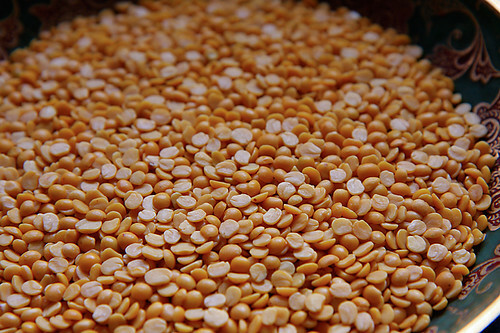 You can use a variety of dals like mung dal, masoor dal, urad dal or channa dal, either in combination or individually. Adjust the consistency of the water according to taste. This is great served with jeera pulao or roti. Wash the dal in a colander over a running stream of water and soak it in 2 ½ cups water for about 15 to 20 minutes. In a pressure cooker, place the dal with the soaking water and turmeric, ghee and hing and give 3 whistles. Alternatively cook in a saucepan until the dal breaks down and is completely cooked, about 45 minutes. Mash the dal completely with a whisk and keep aside. In a wok or kadhai heat the ghee or vegetable oil over a medium low flame. Do not allow it to smoke. Stir in the cloves and the cinnamon. When the cloves puff up, add the asafetida, slit green chillies and ginger paste. Stir for a minute and then put in the chopped tomatoes. 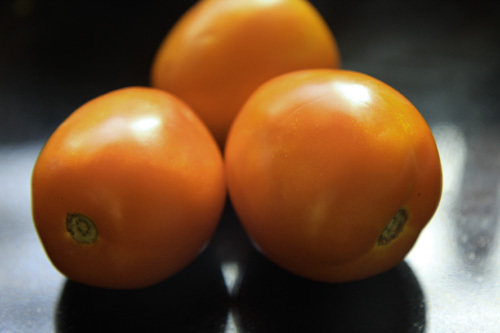 Cook until the tomatoes are pulpy, about 5 minutes. Stir in the coriander seed, cumin seed, dry mango and red chilli powders and cook for a couple of minutes more. Mix the prepared seasoning with the cooked dal. Put in the hot water, salt, chopped fresh coriander and bring to a boil. Perfect comfort food. Hope you are doing good Anushruti. The meal looks healthy and delicious. I definitely want to give this a try. Hope everything works out well for you! Neither of your babies, change of place, time and space or whatever! Maunika, Soma, El, Simi and Preethi: Thank you for all your comments. 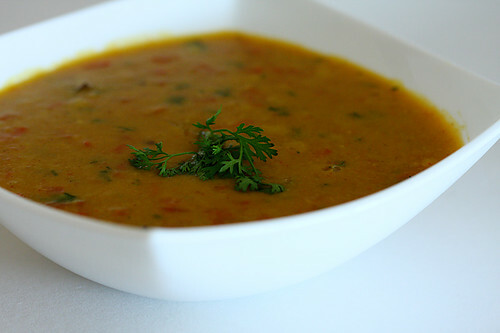 A very simplified recipe for Dal Tadka…tasted very good with hot steaming rice. Thanks a lot for the recipe. I got a million pound question. Can you cook Dal without pressure cooker? I can cook rice in pan, however not possible to cook dal without frying pan. Yes…you can cook dal without a pressure cooker. Soak the dal (toovar dal or moong dal, some other dals need to be soaked overnight) for 15 to 20 minutes and cook the dal in a saucepan. It would take longer than a pressure cooker to cook dal this way, about 45 minutes to an hour. 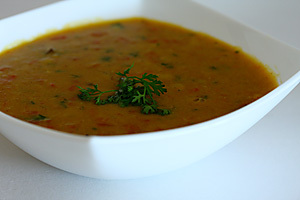 Hi Anu, I made dal following your recipe yesterday. The only variations were,I used a combination of whole dals (Moong, Muth, Masoor) and used curry leaves also for seasoning.. It turned out just so good! The cloves and cinnamon give an awesome flavor and taste to the dish! Ashwini: Those are healthy substitutes which I'm sure tasted great too! Hi, Anu just wanted to make Dal tadka since long time saw in your blog and tried it yesterday…was very tasty..my kids liked it too. Thanks for sharing.Keep posting the Divinity..
Bhuvana: That's wonderful! Glad you and your children enjoyed it. Anaita: This is one of my favourite dishes! So happy you like it. Few people appreciate such simple dishes. Rashmi: This is one of the simplest and the best recipes. Glad you liked it! Gayatri: I love to hear reviews for this simple creation. Glad you enjoyed it! did this for second time and loved it absolutely. thanks for the recipe. what astounds me is the exact measurement for water even. it shows ur meticulous preparation for this site. Vasumathy: Thanks for noticing this and your appreciation.